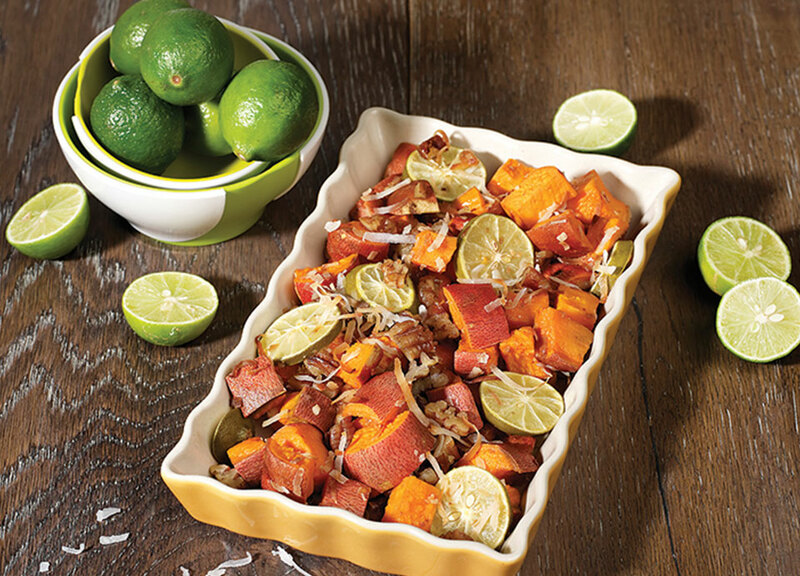 Heart-friendly yams are tarted up with lime juice and shredded coconut in this festive side dish. Serve it with lamb or my Ostrich Meatballs (Age Beautifully Cookbook). It also goes well with turkey, pork, and meatloaf. BENEFITS: Yams (and/or sweet potatoes) contain carotenoids and fiber. Carotenoids inhibit cancer and tumor growth, reduce your risk of heart disease, and support immune function. Fiber lowers blood cholesterol and, like carotenoids, reduces your risk of heart disease. Remove from the oven and toss with the lime juice and/or lime slices.